Bialystock and Bloom! Those names should strike terror and hysteria in anyone familiar with Mel Brooks' classic cult comedy film. Now as a big Broadway musical, THE PRODUCERS once again sets the standard for modern, outrageous, in-your-face humor. It is a truly "boffo" hit, winning a record twelve Tony Awards and wowing capacity crowds night after night. The plot is simple: a down-on-his-luck Broadway producer and his mild-mannered accountant come up with a scheme to produce the most notorious flop in history thereby bilking their backers (all "little old ladies") out of millions of dollars. Only one thing goes awry: the show is a smash hit! The antics of Max Bialystock and Leo Bloom as they maneuver their way fecklessly through finding a show (the gloriously offensive "Springtime For Hitler"), hiring a director, raising the money and finally going to prison for their misdeeds is a lesson in broad comic construction. At the core of the insanely funny adventure is a poignant emotional journey of two very different men who become friends. With a truly hysterical book co-written by Mel Brooks and Thomas Meehan (ANNIE) and music and lyrics by Mr. Brooks , THE PRODUCERS skewers Broadway traditions and takes no prisoners as it proudly proclaims itself an "equal opportunity offender!" Fionnuala Handy, Sinead Wyer, Grainne Donoghue, Georgina O'Toole, Martina Carney, Tamara Keegan, Sarah Sheridan, Stacey Buckley, Grainne Kinsella, Michael Murray, Sinead Doorley, Bebhinn Wynne Judge, Niall Keegan, Davin Walshe and Tommy Scanlon. A.I.M.S. Crit. by Emer Halpenny. The Mayor of Waterford, Cllr. Pat Hayes, opened the 51st. Waterford International Festival of Light Opera as part of the transitional, Waterford International Music Festival. He was welcoming and supportive and sang a few lines from a show as well. While there might be mixed feelings about bringing the Festival back to May and not the traditional September time or the November date of the 50th Festival, the quality and excitement of the first weekend, should have dispelled such doubts. The best of musical theatre strutted its stuff, as the show went on and the Theatre Royal was the place to be, under a phenomenal Supermoon.The portents were good, and the heavens echoed the celebration. 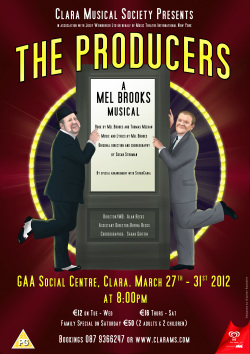 The Producers It was opening night, onstage and off stage, as Clara Musical brought their wonderfully entertaining, production of The Producers to the 51st Waterford International Festival of Light Opera. A new timeslot, another change in direction and a problem marketing that change,but as Aoife Devery and Fiona Rigney,as Usherettes, opened the onstage doors, the Festival was back, the competition was on. There was anticipation, and there was laughter, torrents of mirth, spurts of craziness in a show that makes fun out of a range of almost taboo subjects. Hitler---the crazy show within a show, Springtime for Hitler. Mel Brooks masterpiece on the Theatre Royal stage. Ya wohl, mine Theatremeister. The story of larger-than-life, Broadway producer, Max Bialystock and his timid accountant, Leo Bloom, who set out to get rich by staging the worst flop--a show that should close by page four, but as the onstage reviews said--"A satiric masterpiece", " a surprise smash", " It was shocking, outrageous, insulting...and I loved every minute of it" Sometimes shows make reviewing easy and Clara rocked the house with laughter, invaded the funny zone,detonated helpless laughter in an anschluss of entertainment, where creativity,music, acting, comedy, lighting, scenery and glorious song and dance annexed the stage and left the audience as prisoners of entertainment. I had seen this production, recently in Clara and this time it was funnier and more hilarious. I am still laughing, as I write this review, about the pigeons in the rooftop scene. Clara represent all that is great and optimistic about musical entertainment, with excellent community commitment, and this was so evident in the big brash song and dance numbers.Christy Bannon played a range of cameo parts, as did Nathan Meehan, Amanda Cunningham and Nigel Sammon. Eoghan Fingleton was a festival of campery as Carmen Ghia, Wayne Handy was a little subdued as Roger de Bris and Aoife Fitzsimons as the crazy old lady, Hold Me Touch Me, was wonderful. Seamus Carroll delivered a crazy, Nazi playwright, Franz Liebkind, with fabulous timing and comic business. Natalee Kelly, as Ulla the Swedish bombshell, reached her assets out into the audience, to deliver " stage to audience relationship". Her song, When You Got It, Flaunt It, was indeed a BIG number, an outrageous flash of show business. But the success of the entertainment was the towering performances of Paul Norton as Max and Malcolm Whelan as Bloom.With superb singing and physical comedy, they swept all before them. Whelan wheedled and wimped like as star and his, That Face, routine with Ulla was a wow. Norton was superb as, The King Of Broadway and the crazy lecherous cheque-collector in, Along Came Bialy. His wonderful recap song, Betrayed was a standout of standup. Alan Recks was splendid as Director / Musical Director. Sarah Griffin choreographed with panache. Simon Canon was a busy stage director. Derek Recks provided excellent sounds and "foley" work. Edel Kennedy excelled with a blitzkrieg of props and the hilarious puppet pigeons. singing, some wonderful technical surprises and lashings of comedic moments. The director and musical director, Alan Recks drove the show along, and it built and built, getting better and better and funnier and funnier. The big musical numbers, I Wanna Be A Producer, the crazy Little Old Ladies scene, Along Came Bialy and the outrageous, Springtime For Hitler, were wonderful and the energy onstage was so impressive. Without two strong male leads, this show would be difficult to carry off and Clara had two splendid lead performers in Paul Norton as Max Bialystock, the scheming,conniving,Producer, who is onstage for most of the show and he just got better and better and funnier and funnier and his acting and singing were a joy. Malcolm Whelan, as Leo Bloom, the accountant, who wants to be a producer gave another splendid performance, of loss, frustration, panic and craziness, had me in floods of laughter and spasms of admiration for his wonderful comedic work while sharing a stage with a manic Max and a curvy Ulla, the Swedish dreamboat. Natalee Kelly was a riot as Ulla and she seduced not only Leo, but the audience as well. Even opening her coat was a production. Her big number, When You Got It, Flaunt It, was lagrant and fragrant, in the best possible taste. Add to these, John Coss as Carmen Ghia, Wayne Handy as Roger DeBris and Seamus Carroll as Franz Liebkind and you had a show to remember. I must make special mention of Aoife Fitzsimons as Hold Me Touch Me was hilarious as a Little Old Lady with a Zimmer frame. When Clara bring this show on Friday 4th May for the Opera festival, make sure you have a ticket. Get tickets now.